So I’ve decided to spend a few days basking in the bliss of idleness. Lest you think this an April Fool’s joke (and it would be a good one, wouldn’t it? ), I will hastily add that I’m not actually doing nothing – just catching up on email, cleaning the studio, percolating on what to do with the remaining 11 sections of the color study, and finishing out some minor commitments. But I’m enjoying not having any deadlines for anything – after cranking hard for several months, I can finally sit back and take a breather. Hurray! Time to do non-essential things. Once I’m done taking a break, there are a few projects I’d like to work on. The first one is the book. I came back from my design workshop in Colorado with a much clearer sense of audience. I had been split between writing a book for novice designers, and one for intermediate/advanced designers who were ready to “up” their game. The workshop made me realize that I want to write a book for intermediate/advanced designers. That means I can eliminate some of the earlier chapters, and need to beef up the later chapters, especially the sections on what makes a good design. And now that I have some free time, I plan to make those revisions. These will be appropriate for the Fine Threads Study Group samples, plus they’re just darned cool! And, if I set things up right, I should be able to use the same warp for more phoenixes. I think it would be interesting to weave them with wavy lines in the background. I’m still thinking about it, though. My main reservation is that I’d like to use 140/2 for the ground fabric and 60/2 silk for the pattern weft. Last time, with phoenixes and a turned summer and winter draft, I wound up setting the warp at 72 ends per inch. Since this draft is not turned, that means weaving with two shuttles. At about 145 picks per inch. Yeah. I have a high tolerance for “forever warps”, but that might exceed even my limits, especially if I plan to weave yardage for a scarf/shawl. If I turn it – and I’d have to figure out how to do that – I’d have to put the pattern colors in the warp. That works fine for a single color, but I want to experiment with different colors in both turtles and phoenixes. I could paint the warp, but that gets into a different set of headaches. Lots of tradeoffs, lots of variables. I’m going to let that percolate while working on the color study. I absolutely love the fabric on the front cover, and think the textured, ribbed look would make a great background for a phoenix woven in kid mohair/silk, then scrunch-dyed afterwards. I’d change the color of the background to dark blues and purples, of course, and maybe embellish the phoenix with beads, ribbons, etc. – I think it could make a really nice piece. Probably a wall hanging, as I think the background would be too thick and stiff for clothing. Meanwhile, Fritz is not idle, either. He is taking his “guard cat” duties quite seriously, spending much of his day either on the rug by the back door (where he keeps an alert eye for cat toys, aka the giant American cockroaches that live outside and occasionally venture in) or by the front door, waiting for us to get home. 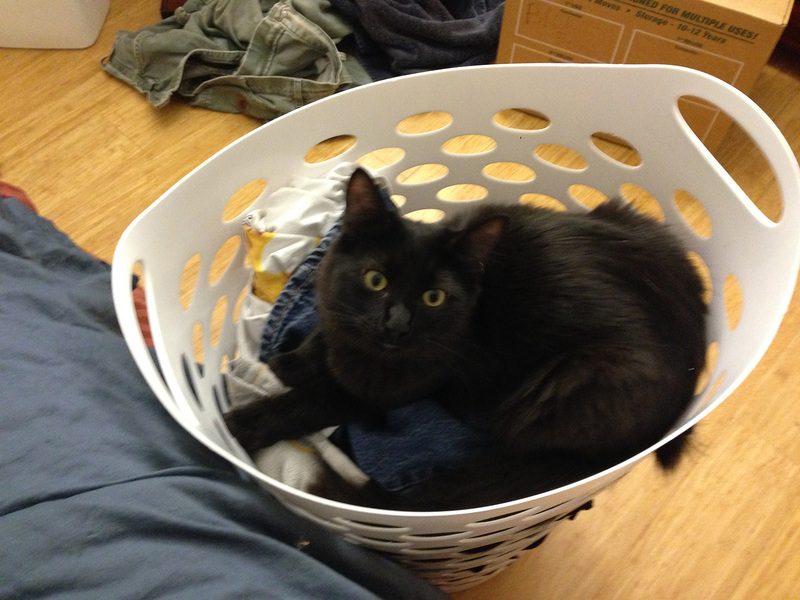 But he also guards other things, like laundry baskets. Especially if there is clean laundry involved. He gets cat hair on everything, of course, but isn’t that a small price for knowing your laundry is safe? I suggest that much of the structure of a textile is determined by the structure of the yarns in the loom web – singles, plied, cabled, S or Z twist, worsted or woolen or something in between. Certainly silk, cotton, and cat hair all behave differently than wool, polyester, and all of the other good stuff that can be spun. Then, there are options on finishing the fabric. There was a time when all the best weavers used hand spun, and in that time some of the best weaving was done. When a weaver had a dream, some hand spinner would whip up a few hanks to weave the dream. More recently, hand spinners have stopped supplying weavers with fine yarns for weaving. 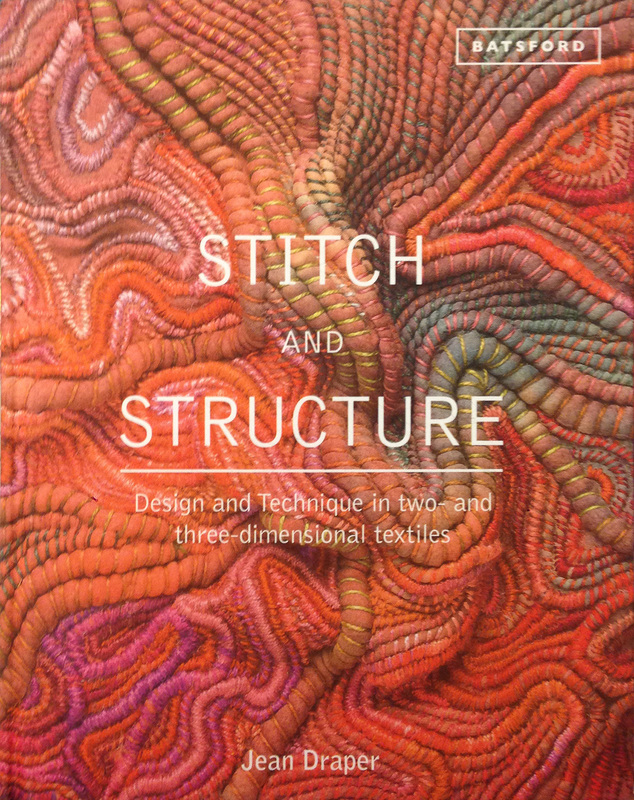 “The structure of a textile” – what do you mean by that? Typically in weaving “structure” refers to the interlacement of threads, which is of course not at all related to the physical structure of the yarns. Do you mean characteristics such as the “hand” of the fabric, its durability, its stretchiness, or all of the above? I work with mill-spun yarns, partly because I weave with fine yarns and have neither the time to spin my own nor the money to hire a spinner to do it for me – if I could find a spinner who spins a 15,000 ypp two-ply. I’m sure they exist, but the finest I’ve spun myself is a 9,000 ypp two-ply. In theory that means I could spin an 18,000 ypp singles and use that, but I’m not sure I could spin that consistently at that weight to produce a yarn that would stand up as warp. I also don’t want to invest the time to do that, since I don’t expect it would make a large enough difference in the quality of the finished products that I make. (I don’t doubt that it would make a difference, just that it would make enough difference to be worth the time investment.) So given that, I don’t generally use handspun yarn. On the whole, I’ve been pretty satisfied with what I get from the mills. I don’t often work with types of weaving (collapse weave, etc.) that require yarns outside the usual mill-yarn spectrum (e.g. S or Z twist, overtwisted yarns, etc. ), and I have generally found that the few times I do need it, I’ve been able to cobble up sources for overtwisted yarns or S and Z twist yarns. There are a few vendors that provide those in millspun, such as Habu Textiles and Giovanna Imperia. Their prices are high, but that would be the case in purchasing from a handspinner as well. I would certainly be interested in experimenting with fine handspun yarn, but since that is about as rare as hen’s-teeth, I haven’t pursued it further. Are you the same Aaron who writes the “A Fisherman Knits” blog? If so, you are in my neck of the woods, and it might be interesting to have a conversation over lunch or coffee sometime.